Costa Rica has been recognized several times as a paradise for nature lovers. Its biodiversity, protected by a solid system of National Parks and Protected areas, keeps the 5% of the world biodiversity. How? Well, the country has been blessed with a wonderful weather, a combination of microclimates that allows the growth of a varied flora and fauna; and with a population concerned with sustainable development. But beyond this natural wealth, there is an unimaginable world under the sea that only few have the fortune to explore. Costa Rica is a privileged destination for divers, and the colorful marine landscapes formed by the coral reefs and the variety of fauna, can’t be compared with any other diving destination in the world. If you are already an experienced diver or if you are interested in using your next holidays to dive, Costa Rica is the perfect destination for you! 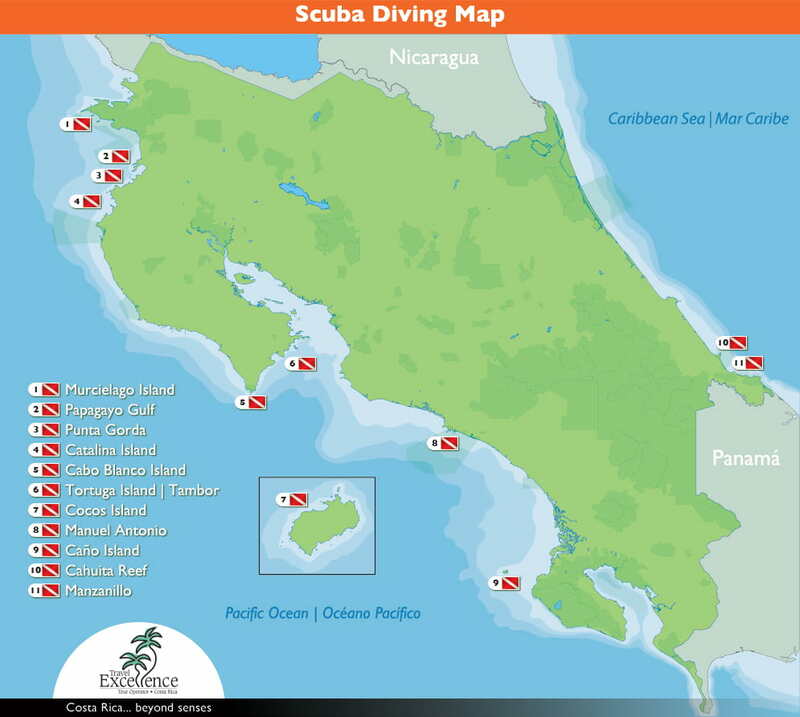 Where are the best places for scuba diving in Costa Rica? There are ideal places for scuba diving along the country, but here is a list of the best and most popular as well as a brief description of the species that can be found in each one. It’s important to know that the majority of the diving spots in Costa Rica are located in Guanacaste, around 4 hours away from Juan Santamaría International Airport (SJO) but just 1 hour away from Daniel Oduber International Airport (LIR). This is the airport that we recommend you to use if you are coming only for some scuba diving vacations. One of the best things about Guanacaste is that you can find other popular activities to do, to complement your visit to the country such as canopy tours and whitewater rafting tours; and in this region are also located most of the all-inclusive resorts of Costa Rica. Water temperature: between 23°C and 30°C. Due to the frequent presence of cold thermoclines (up to 16°C) is always recommended to wear a suit of 3 mm. Visibility: Between 25 and 50 feet. Species that can be seen here: white tip sharks, stingrays, eels, lobsters, seahorses and octopuses. Species that can be seen here: white tip sharks, steels, lobsters, seahorses, octopuses and stingrays (season from January to May). Water temperature: between 23°C and 30°C. Due to the frequent presence of cold thermoclines (up to 16°C) is always recommended to wear a suit of 3 mm and the use of NITROX. Visibility: Between 25 and 70 feet. Species that can be seen here: sand tiger sharks, stingrays, spotted eagle rays, whale sharks, eels, lobsters, seahorses and octopuses. Visibility: Between 25 and 60 feet. Species that can be seen here: white tip sharks, stingrays, banded coral shrimps, turtles, eels, lobsters, seahorses and octopuses. Visibility: Between 40 and 80 feet. Species that can be seen here: white tip sharks, whale sharks, stingrays, banded coral shrimps, turtles, eels, lobsters, seahorses and octopuses. Caño Island is also a popular place for whale watching expeditions. Humpback whales can be found here from July to October. Water temperature: between 24°C and 26°C. Due to the frequent presence of cold thermoclines (up to 16°C) is always recommended to wear a suit of 3 mm. Visibility: Between 20 and 80 feet. Species that can be seen here: turtles, stingrays, dolphins, eels, octopuses, hammerhead sharks, white shark fins and red-lipped batfishes. The diving expedition to Coco’s Island takes about 10 days and includes nightly immersions. Coco’s Island was defined by Jacques Cousteau as one of the best diving spots in the world. 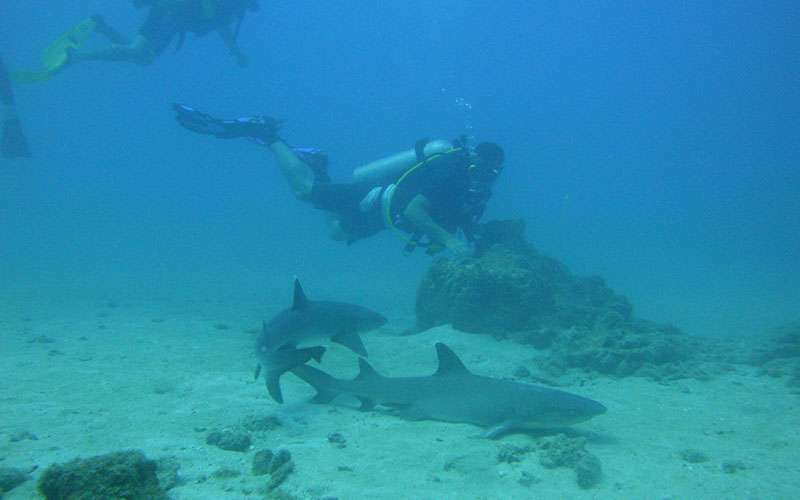 ** It is also possible to do diving in the Caribbean Sea of Costa Rica. To dive in places such as Cahuita National Park or Gandoca - Manzanillo Wildlife Refuge, you have to do it between August and October, when the sea is calmer. After that, the conditions are not very suitable for diving. Do I need a certification for scuba diving in Costa Rica? 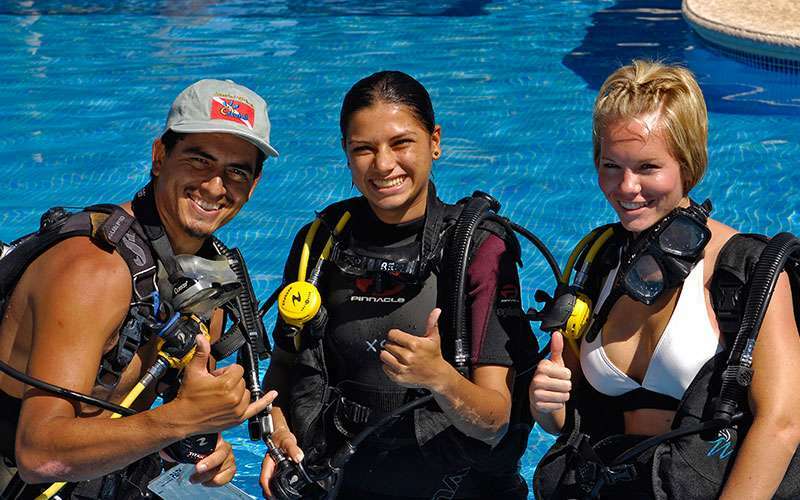 You need the Open Water Diver PADI certification as a minimum requirement to dive in Costa Rica and around the world. If you have already completed this course, it is not necessary to do it again; you just have to present your certification to the diving company here. If you are a beginner and you haven’t done the Open Water Diver PADI course, you can do it here in Costa Rica. This is a theoretical and practical course, where you will learn to use the equipment, breathe under water and handle emergencies. After the theoretical phase, you will practice pool immersions and then you’ll be ready to real dives in the ocean. At the end of this course you will be a certified diver, but take into account that you need to complete 5 pool immersions and 4 ocean immersions, which will take at least 4 days. But this is not the only course you can take, if you are already an Open Water Diver PADI but you want to strengthen your diving skills you can take the Advanced Open Water Diver PADI. This course includes different kinds of immersions such as digital underwater photography, night diving and wreck diving. As an additional course, you can also take the Oxygen Enriched Air NITROX course, which consists in 1 day of theory and 1 day of practice and will give you the possibility to dive in special places where the NITROX air is required. You need the Open Water Diver PADI certification to dive in all the locations mentioned before, and the Advanced Open Water Diver PADI to dive in Catalinas Island and Bat Islands. The NITROX course is recommended - but not a requirement - for diving in Bat Islands and Coco’s Island. When is the diving season in Costa Rica? 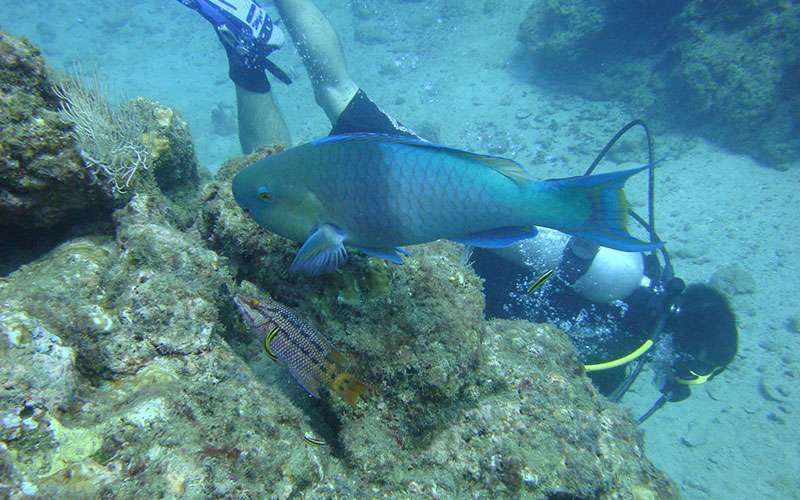 Great scuba diving packages can be enjoyed all year round thanks to the idyllic Costa Rica weather. 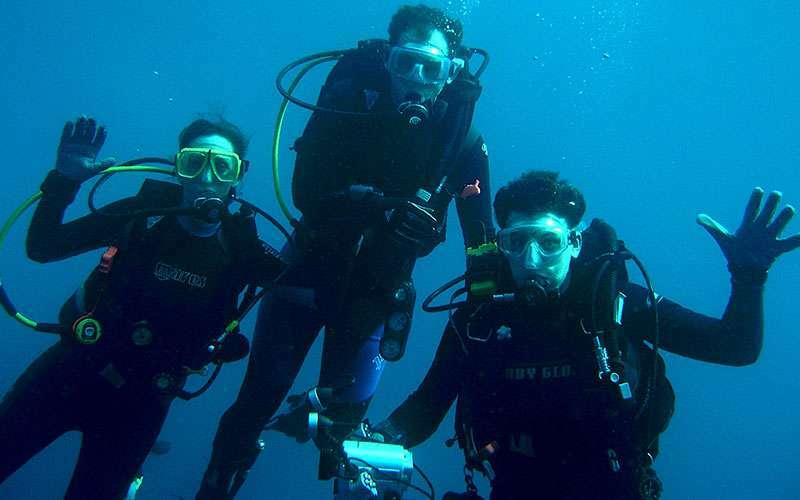 The rainy months in the country are from May to November, but even those months you can scuba dive in the majority of the scuba diving locations. Obviously, there are special seasons for some species. For example, diving in Catalinas Island is good all year round but the best time is from December to May, where have been seen 50 stingrays in a single dive. Not to have any of the following characteristics: pregnancy, deviated septum, heart problems, ruptured eardrums or a recent surgery. Travel Excellence has planned some scuba diving itineraries, which include the best scuba diving locations of the country and the most reliable scuba diving companies. Ask one of our agents for more information.